Gabriela Jauregui’s Controlled Decay (Black Goat, 2008) presents a dazzling range of theme, tone, and form. The book is divided into five sections: “Dust,” “Bone,” “Fat,” “Enamel,” and “Nail.” What holds the poems together is how their contents are ciphered through the poet’s real and written body. In this sense, the poems attempt to capture decaying bodies, decaying cultures, and decaying landscapes. By doing so, the decay is “controlled”—or at least held—in the space of the poem. The very first poem, “Get On Down to the Floor to the Heaven of Other Animals,” puts the reader in the middle of the dance floor, of the threshing ground: “live music alive the music I like should beat beat beat me to you the space between nothingness is music” (21). Echoing T.S. Eliot’s “Burnt Norton” and Lorca’s thoughts on duende, this prose poem interweaves the rhythms of death and life, love and loss, body and spirit into a trance-like “cumbia del destino.” This emphasis on being alive is remixed in one of the many “loku” in the book: “deadlines / no more / here’s to lines alive” (36). Jauregui’s poetic lines are undoubtably alive lines. Another element that enlivens Jauregui’s rhythm is her interweaving of Spanish and English in various poems. This short poem, reminding me of Alfred Arteaga’s work in Frozen Accident, stresses the importance of being open—both infinite and infinitesimal—to the rhythms of life and death. A similar poem, “Loku V” reads: “A woman is knot / not / naught” (126). In different ways, Jauregui locates the poet as perceiving subject within the vibrant “zero,” the knot of interiority and exteriority. The poems in this strand of socio-political poems culminates in “After Goya (and Fallujah and Kigali and Juarez and Da Nang and Wounded Knee and Tiananmen and Cali and Compton),” which begins: “There are / bodies upon bodies upon bodies upon bodies upon bodies / inside my pen” (83). 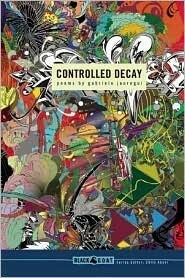 Controlled Decay is a powerful first book that shows the range of Jauregui’s talents and concerns. She shows both a compelling sense of musicality with an undeniable ability to control image and line. Her poetry is centered in the knotted zero of a woman’s body, where external injustices inflict the body viscerally. Jauregui transforms these inflictions into a mouth uncrossed out and shaped into song.